George Thomas is perhaps most widely known for his watercolors. 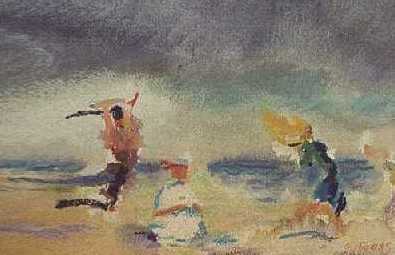 Ghostcasters, below, is possibly his best known watercolor. The painting at left is called Beachside Bolero. Winter Abstract, the acrylic painting at lower left painted in 1990, was part of a flat two-dimensional series of work done on Nantucket. The painting below right, Seaside Dory, was painted in 1999 in Nantucket and was inspired by watercolors of John Singer Sargent.